Whether you are on your holiday alone, with your family or friends, visits to water parks are sure to provide you with some awesome adventures on your vacation. 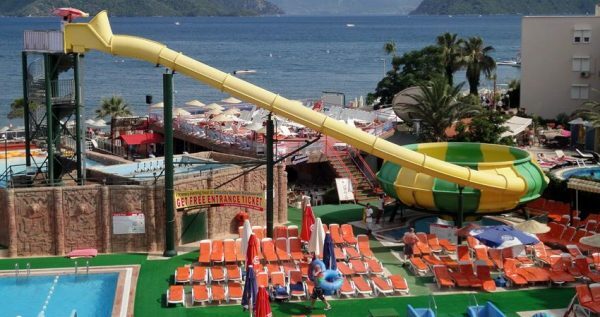 Icmeler is not very far away from Marmaris and you can easily spend a day in Atlantis Water Park from Icmeler. Atlantis Water Park is an amazing complex located near the lovely city of Icmeler, a short drive away from the town itself. 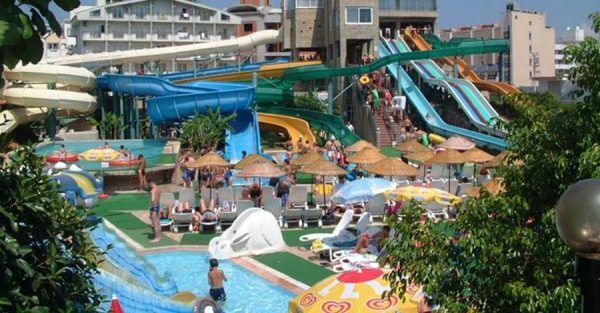 The relaxation and fun you will have at this wonderful complex are some of the main reasons you should put it on your “to do” list while staying in Icmeler. 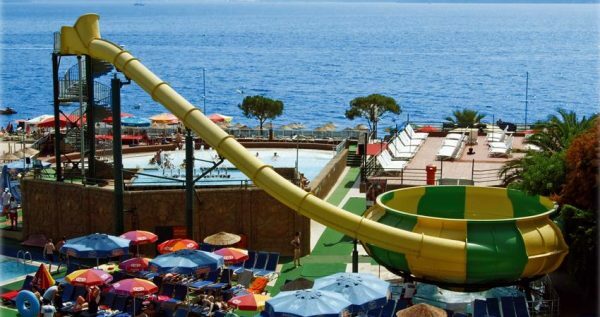 There are numerous thrilling activities in the offer of The Icmeler Atlantis Water Park, which guarantee your time here will pass in a blink of an eye. It is open from 10:00 up to 17:00 every day during the whole summer season, including weekends. If you’re worried about the safety of your personal belongings, you will be offered to use lockers . Your safety and the safety of your things are our top priorities, and we’ll do everything in our power to make you feel comfortable. 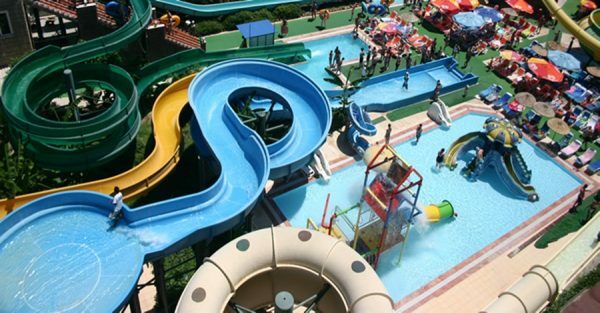 There are so many rides arranged for you while staying in this water park. Every single one is different and more amazing from the previous one. 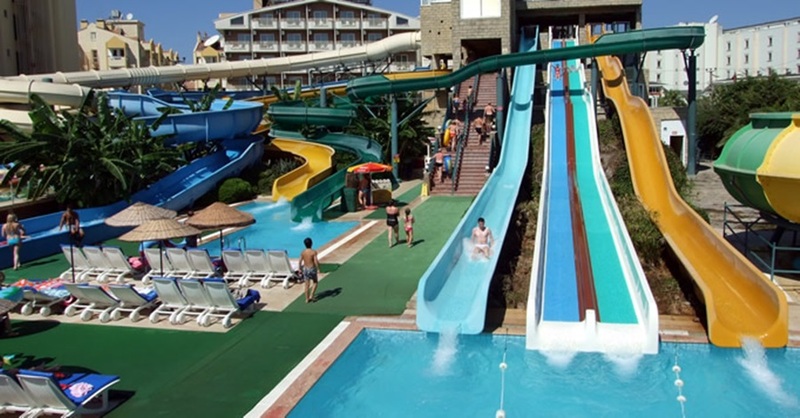 Even though Icmeler Atlantis Water Park is not as big as other water parks in Europe, it is definitely one of the best. It is designed with the sole purpose of making you feel comfortable and giving all of its rides easy access. You can choose your perfect adventure from a wide variety of water slides, and wave or regular pools. The water is being cleaned on daily basis which is something that unfortunately not all water parks provide to its visitors. 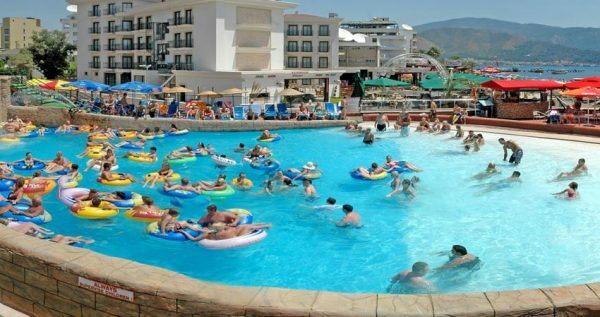 On the other hand, you just want to spend a lazy day frolicking in the sun, this lovely water park has various spots equipped with sunbeds and umbrellas. You can unwind and get cozy while sipping on some delicious, refreshing beverage, while the rest of your party has some fun of their own. Reserve your tickets with us and we’ll make sure this vacation becomes your best vacation ever. If you like visiting aqua parks Icmeler Aqua Dream Water Park can be also interesting for you. 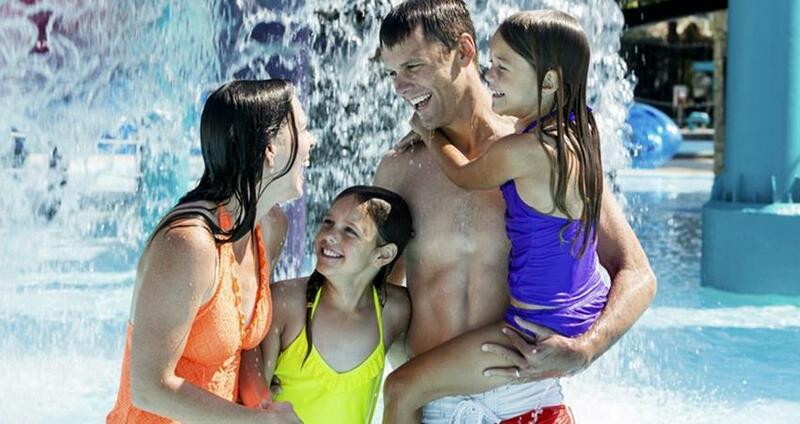 Atlantis Water Park is open for visits from 10:00 till 17:00 in the day time. As Excursion Mania we offer our guests 3 sessions for free pickup service from any hotel in icmeler during the summer season. Once you choose the time of your pickup, we will arrange a free transfer from your hotel to the water park. 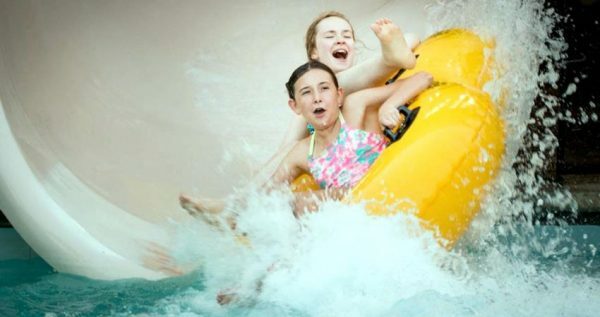 Atlantis Water Park is equipped with all the necessary facilities to make sure that you and your friends and family have one carefree and fun visit. Among numerous amenities which you will be able to use while here are lockers, safety boxes, changing rooms, showers, toilets. 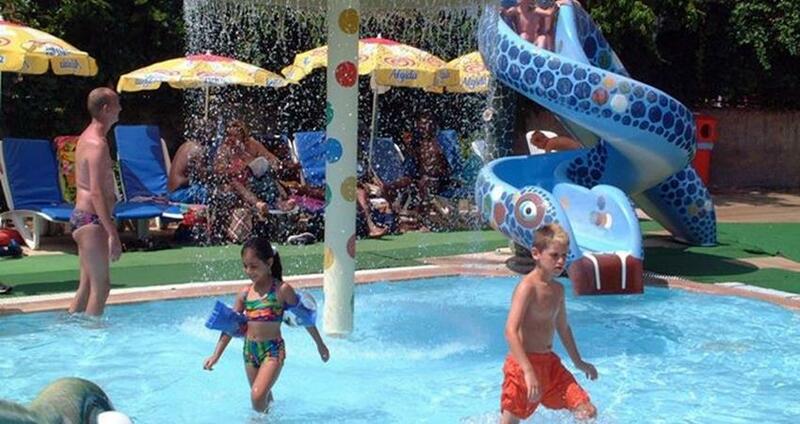 This water park also has a private beach equipped with sun beds and umbrellas. With eight fun and different waterslides, and tubes to play with free of any additional charge. This park is just the spot to spend a day playing and frolicking in the sun. 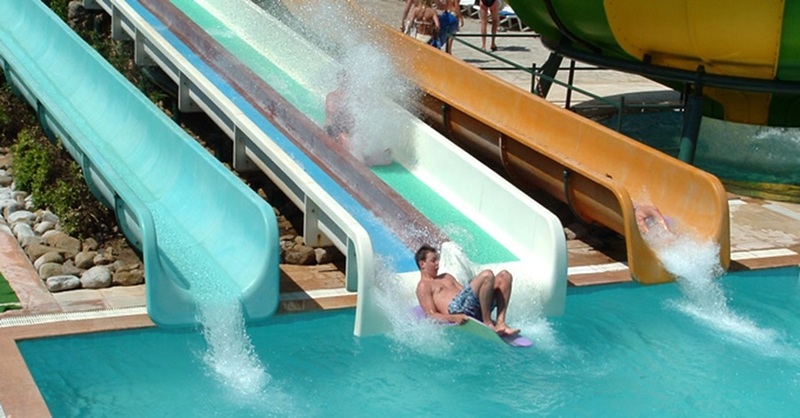 The wave pool is thrilling and very popular sporting unit. It usually begins at noon and runs for 15 minutes per hour. 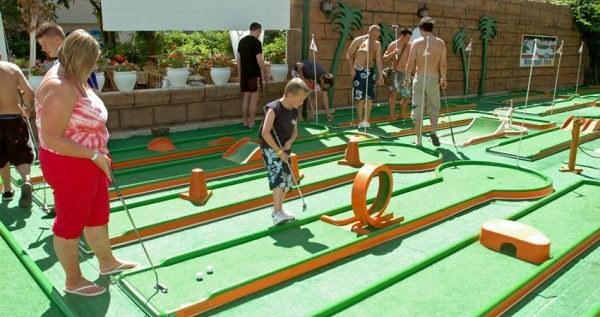 There is also a mini golf terrain situated on the beach, and this 18-hole course is one of the most popular places at the park. Visitors should keep in mind that the fee for the golf course is not included in the tour price, and it is charged extra. Once you arrive at the park, you will be given an arm band, and with it you will be able to go in and out of the park throughout the day. First Aid: This great park has fully equipped first aid room on its premises, because your safety is their top priority. Experienced and skillful staff members are always there to intervene and help you out if necessary. Food & Beverages: Among this Park’s numerous amenities there is also a delectable Restaurants & Bars in the park. Seating Area: There are seating areas all over the park premises, so you can rest and enjoy the scenery around you, while sipping on your favorite refreshing drink. Bottle and Baby Food Warming Facilities: These useful facilities are offered at all of the catering outlets in the park. Changing Facilities for Babies: These facilities are provided in all of the ladies toilets, as well as the ladies and family changing rooms.